Most fruits and vegetables are chock full of vitamins and minerals, and pineapple is no exception. 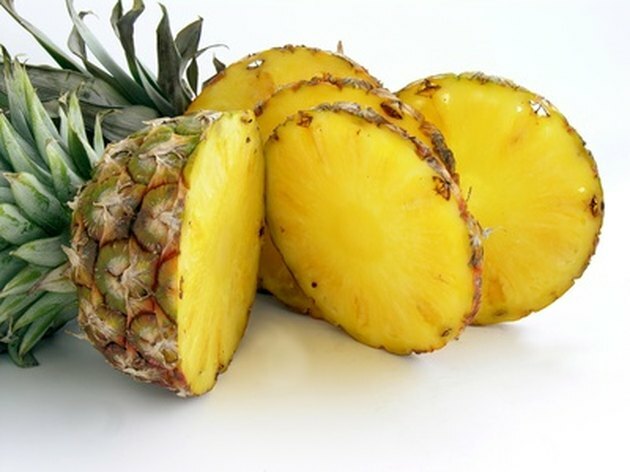 Due to the abundance of these vitamins and minerals, as well as the presence of bromelain, an enzyme found in pineapples that may have additional health benefits, pineapple is a good choice to help you meet the recommended five servings per day of fruits and vegetables -- whether you choose fresh, frozen or canned pineapple. One cup of fresh pineapple chunks provides you with 40 percent of the daily value for vitamin C, 10 percent for thiamin, 8 percent for vitamin B6, 6 percent for magnesium and 4 percent for folate, iron, riboflavin and niacin. Pineapple is also a good source for manganese and copper. A cup of pineapple contains only 80 calories, provides 2 g of fiber and 1 g of protein; it doesn't contain any fat. Your body uses the manganese in pineapple for bone health and energy production. Thiamin also helps with energy production and vitamin C works as an antioxidant. Bromelain may help reduce the side effects from cancer treatments, treat diarrhea, reduce inflammation and improve digestion; it may also help treat burns, according to the American Cancer Society, although more research is needed to determine its effectiveness for these conditions. Fresh pineapple may have slightly more vitamins and minerals than canned or frozen pineapple. Vitamin C is one example, since processing can affect nutrient levels and vitamin C is particularly sensitive to these effects. However, frozen pineapple may be preferable to fresh if the pineapple has not been picked recently. The longer a fruit or vegetable sits around before being used, the lower its vitamin and mineral content. Many frozen fruits are frozen right after harvesting, so they maintain most of their nutrients. Pineapple is safe for most people in the amounts normally consumed. However, bromelain can interact with amoxicillin and tetracycline, so you may want to avoid eating pineapple if you are on these medications. Pineapple juice from pineapples that aren't ripe can cause you to vomit, and eating too much pineapple can cause your mouth and cheeks to swell, according to Drugs.com. Consuming large amounts of bromelain may also cause side effects including nausea, diarrhea, skin rashes and vomiting.